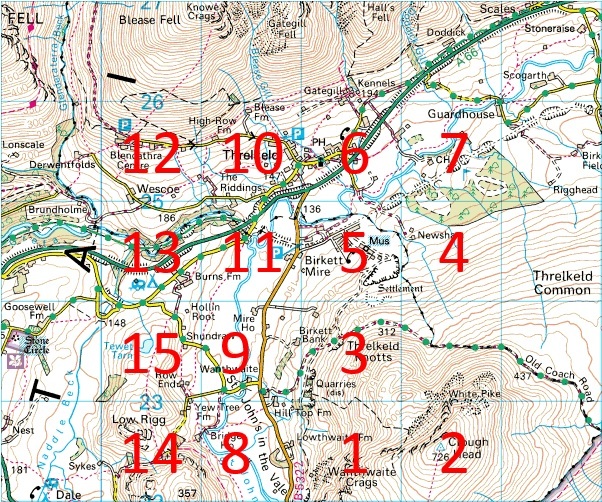 There are 15 cylinders (Circles) in a grid formation in front of Clough Head (see the Maps tab). Each cylinder is 400m radius. Simply fly as many cylinders as possible in numerical order in a single flight. (You must record at least one trackpoint inside each cylinder for it to count). Send your igc file to Peter Askew. If you know his e-mail address, then you can send it to him directly. If you don't know his e-mail address then send him a message using this form and Pete will get in touch with you. Once Pete has checked the file, your score (the highest number achieved) will be posted on the leaderboard. If 2 or more people have the same score, then the most recent flight is highest. This is more about challenging yourself, than out performing everyone else. All due recognition should go to the Pennine Soaring Club for their Parlick Grid Challenge. To download the file to your PC, right click on the icon and then use "Save Target As" or "Save Link As" (or similar). The kml and gpx file have been through a conversion from the WPT file.